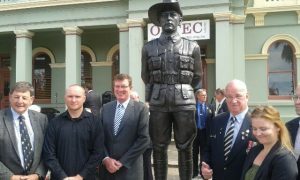 Descendants of John Patrick Hamilton VC with Orange City Cr Reg Kidd, NSW Member for Calare, Andrew Gee and Orange RSL sub-branch vice-president Chris Colvin. Image courtesy Orange City Library. 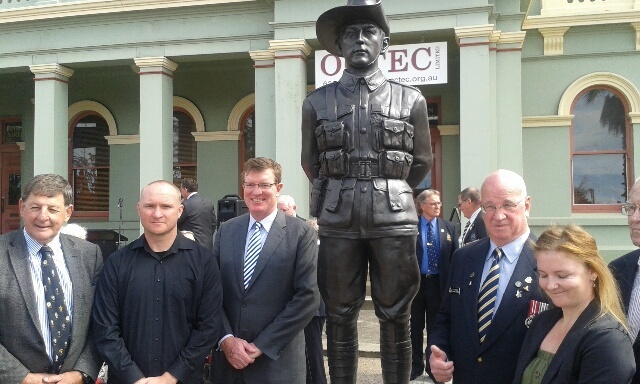 A statue dedicated to the memory of Victoria Cross recipient John Patrick Hamilton is unveiled in Orange. Fifty people attend the ceremony, including descendants of John Patrick Hamilton VC spanning three generations. Guest speakers include Orange mayor, Cr John Davis OAM, Orange Ex-Services’ Club Senior Vice President, Graham Gentles, The Hon Katrina Hodgkinson, MP, NSW Member for Calare, Andrew Gee, and Ian Burrett JP, whose father, Lt Col Athol Frederick (Joe) Burrett DSO was John Hamilton’s commanding officer.